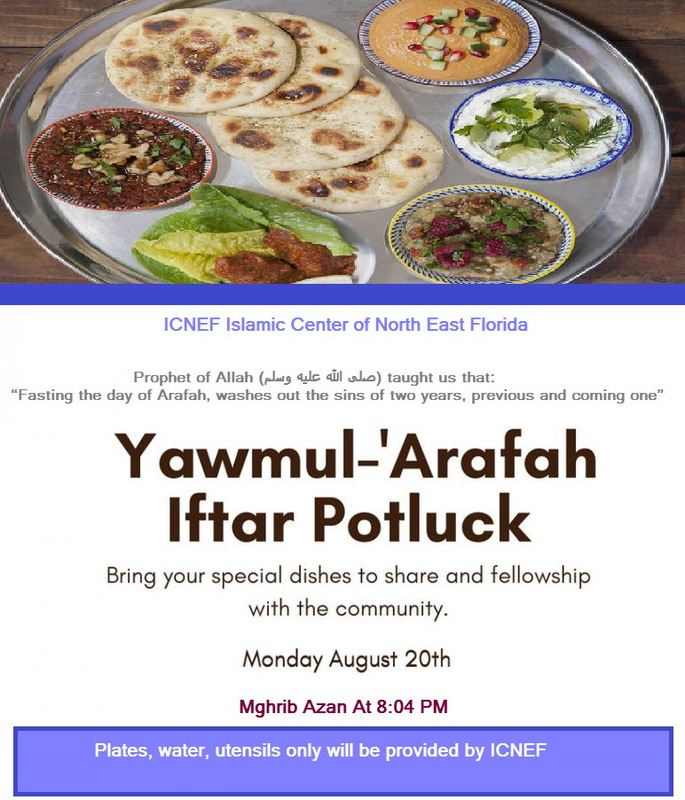 Iftar Potluck – Bring your special dishes to share and fellowship with the community. Magrib Azan at 8:04 PM. لا إلٰه إلا الله وحده لا شريك له، لَهُ الملك والحمد، وهو علىٰ كلّ شيئٍ قدير”. “خير يوم طلعت عليه الشمس، يوم النحر”. Eid Mubarak!!! Tuesday August 21 In-Shaa Allah!!!! Eid Will be on Tuesday August 21 In-Shaa Allah. Location: UNF FIELD HOUSE, 1 UNF Drive, Jacksonville, FL 32224. Park in Parking Lot #18. We will not put paper on the prayer area floor, please bring your own prayer rugs. Are you a Registered Member of the Islamic Center of Northeast Florida (ICNEF)? If not, why not? Do you want to have a voice in how the Center is run or maintained? Then become a Registered Member. Are you aware of all the benefits associated with being a Registered Member? To begin with, all Muslims are natural members of the Islamic Center of North East Florida and are provided access to the religious services offered by ICNEF. From it’s inception, ICNEF has always been open to all Muslims. However, being open to all Muslims, does not convey upon one the rights and responsibilities of running or managing the day to day affairs of the Center. That authority and responsibility rests with the Registered Members of the Islamic Center of Northeast Florida, Inc.
1. Reward from Allah SWT: The greatest benefit of becoming a Member of ICNEF is the reward from Allah SWT, for the commitment to support an organization devoted to providing places of worship for Muslims, Islamic education, and building bridges of understanding among people of all faiths. 2. Right to vote to elect the ICNEF Board of Trustees. The Trustees are responsible for overseeing the day to day affairs of the Center. 3. The Right to be a Candidate for Election to the Board of Trustees. 4. Right to a free/discounted Burial Plot in the Islamic Cemetery Sections: ICNEFowns exclusive sections for use by the Muslim members of the community in the Jacksonville Memory Gardens (a cemetery in Orange Park), and in the Chapel Hills Memory Gardens (a cemetery on St. Johns Bluff Road). Each Registered Member is entitled to a free or discounted burial plot (based on years of membership) in either of the cemeteries he/she/ their families choose and is available for his/her burial. To date, we have not denied any Muslim from using the Islamic Cemetery sections. However, nonregistered individuals estates or family members are responsible for the full market rate cost of the Burial Plot (up to $2700). MASS Clinic – FREE VISION SCREENING!!! 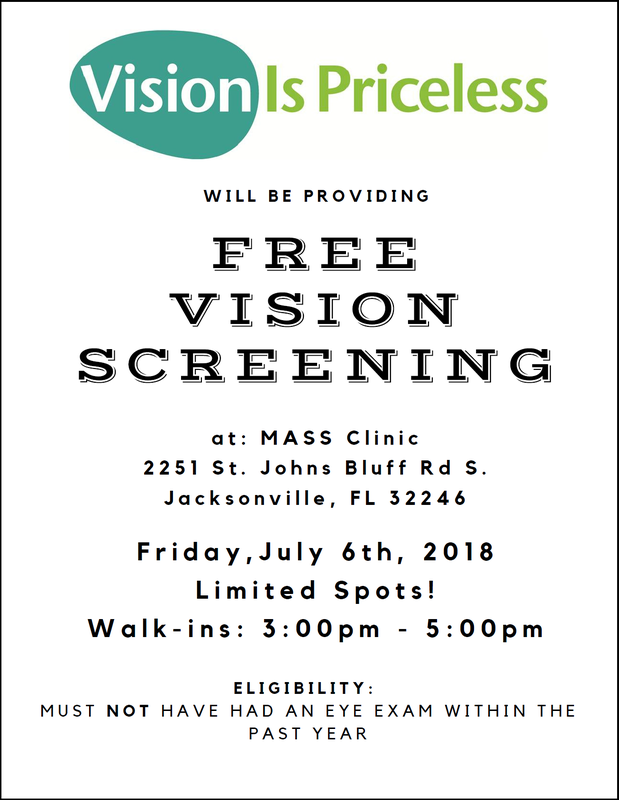 Free Vision Screenings at MASS clinic on July 6th from 3:00 pm to 5:00 pm. Location: 2251 Saint Johns Bluff Rd S, Jacksonville, FL.